The tablet and smartphone boom of the last few years has opened significant doors for both small and large lit mags, the former better able to gain a following through online promotion and availability, the latter to gain further readership by the same means. We, the audience, also benefit from this expanded availability, having the resources to discover new works and rediscover classics. There's a wealth of awesome fiction out there awaiting our eager fingertips. So much so, however, that keeping up with all your favorites can be daunting at times. Sure, you can easily bookmark the various pages you keep up with, but if you're like me, a bookmark in Safari or your web browser of choice is the digital equivalent of a 'check-this-out' note scribbled in the back of your journal: you'll look into it when you think about it again, if you think about it again at all. Better to have some system in place that utilizes visual cues and reminders to help you keep on top of your internet-based reading, no? You may be asking, 'How do I go about setting something like that up?' If you're not asking that, forgive me for being presumptuous; if you are asking that question, let me share some best practices that will have you reading up all your online lit mags with utmost efficiency and expediency. Best of all, everything I'll discuss won't cost you a penny (unless you don't own a smartphone or tablet, and you're suddenly compelled to run out and buy one). On the subject of spending money, I'd like to mention real quick that many of the magazines I'll discuss here have print or digital subscription options and/or single issues for sale. If you have the means to do so, I would definitely recommend sending these publications some support. There's no easier way to keep up with your lit mag reading than by having the latest editions sent directly to your doorstep or Kindle, and subscriptions allow the magazine's editors to pay the bills and stay in business. Plus, most magazines I'll discuss only publish a selection of their issues online for free, so making a purchase gives you access to way more content. Even if you can't afford a subscription, if you love a magazine, pick up an issue here and there when you can. Writers are never exactly rolling in it, but when you find yourself in a good position financially, pass on that wealth to the people who may very well pay you someday. Alright, with that said, let's get into it. Perhaps the simplest way to visually remind yourself about the magazines and journals you want to read is to add links to their websites on your tablet's screen. This is incredibly easy to do. While in Safari on your iPad or iPhone, tap the Share Icon (that box with the arrow leaping out) and then press 'Add to Home Screen.' Boom. The link appears as an icon. Now, if you press and hold one of those icons and drag it over another link, a folder will be created. Title it something to the tune of 'Lit Mags' (as I've done), and there you have it: convenient access to all your favorite online writing. To make the reading experience that much more enjoyable on your smart device, utilize Safari's 'Reader' function. You'll find the toggle button on the far right of Safari's URL pane. Tap it, and an optimized reading page slides into view, allowing you to adjust font size and view the text more like an eBook. Nice, huh? You can add bookmarks to your home screen on Android devices as well. It's a slightly more involved process than on iOS, so here's a CNET article with step by step instructions on how to do this. As for Reading functionality, this seems to depend on what Android-based device you own, but overall there should be a green 'R' icon in your URL window that opens an optimized view just like in iOS. Keep in mind that, whether you're an Apple or an Android, adding to your home screen is device-specific, i.e., your saved links will only appear on your tablet if saved there, but not on your phone, and vice versa. Make sure to only add the links to the device you primarily use for reading. If being locked onto either your tablet or phone sounds too restrictive (it sounds that way to me), there are alternatives to link-saving that also grants access to your content no matter what device you happen to be using. You may or may not be familiar with this, but many sites utilize a method of automatically publishing content called an RSS feed, which stands for Rich Site Summary. This technology is nothing new—it's been around since 1999, and hasn't changed very much since that time—but it's effective for regularly updating content without much hassle. Most all online lit mags utilize RSS, and if you're interested in staying up to date with their content, subscribing to their feed is about as easy as it comes. 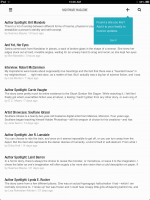 First, you'll need an RSS reader app. Feedly, available for both iOS and Android is a good one, but there are so many more out there, so play around in your respective app stores and find one that works for you. When you've installed the app of your choice, navigate to the lit mag's website. 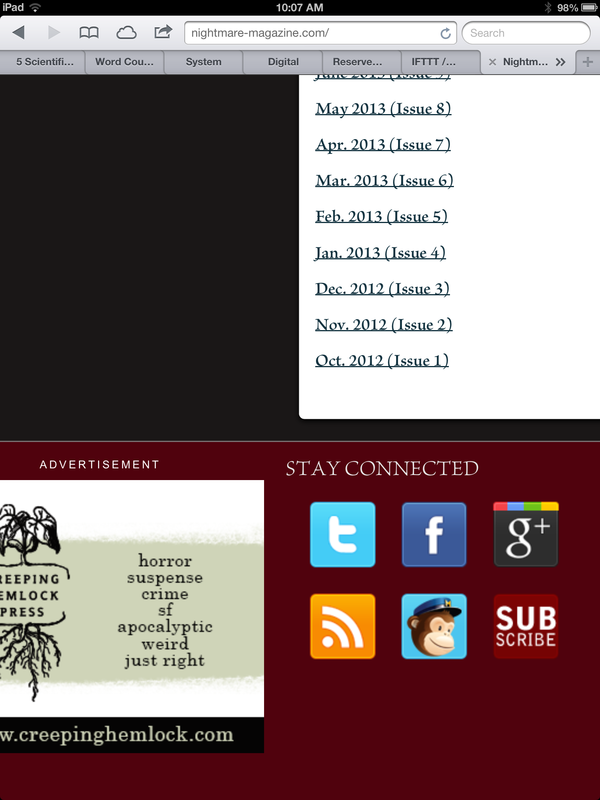 For example, I love reading Nightmare Magazine, an awesome horror and dark fantasy publication. In their case, the link is represented by the official RSS icon (that orange guy with the transmission graphic); other sites may have a simple text link to their feed, but trust me, if you've never noticed that icon before, you'll see it everywhere now. Since mobile devices can't display feeds, you'll need to copy the RSS link by pressing and holding the icon, which will trigger a pop-up menu with a 'Copy Link' option. Do that, then head over to your RSS reader app. In Feedly, for instance, just paste the link into the search field, open the feed, and hit the plus sign to subscribe. The subscription methods might differ in other apps, but I'd wager they're pretty similar overall. That's it. 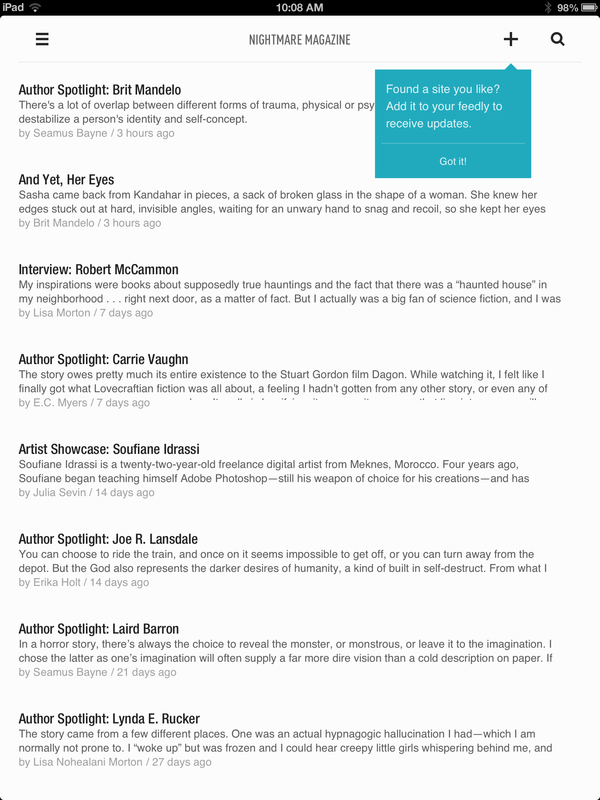 Now whenever you want to read some great fiction, just open your RSS app and start reading. Like the Reader function in Safari/Android browsers, the text will be clean and the margins wide. Beautiful. Saving content is simple. When you sign up for one of these free service, you're provided with an email address that acts as a conduit between your web browser and the app. When you're viewing the webpage, navigate to your Mail function (in Safari for iOS, it's that all-too familiar Share Icon) and send the article to this email address. I've saved it in my contacts list as Pocket, so it's a quick process and I don't have to remember the email address every time. Hit send, and the article will automatically pop up in the app's queue. 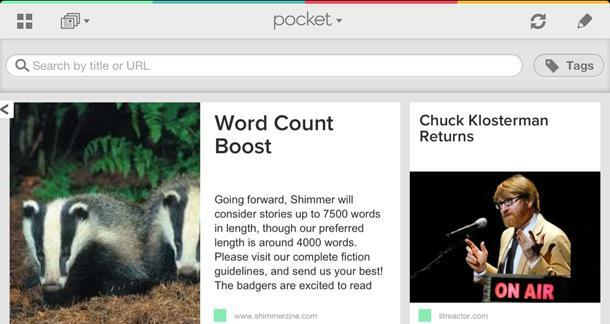 If it isn't obvious already, I use Pocket for my article-queueing. The layout is amazing, it has solid Twitter integration, and the archive function allows me to retrieve any article I've already read. It's free and it's available both in iOS and Android formats. Readability (iOS click here, Android here) is alright, but I don't like the fact that in article view it doesn't tell me the author or incorporate header images. However, if you want more of a clean look, it is the way to go. You might be saying, "That Pocket thing sounds nice and all, but man, I don't want to manually add all that f@*%ing content to my queue." I said this myself, expletives uncensored, so I know how you feel. Fortunately, there is a way to automatically add posts from lit mags to your Pocket queue, which ensures you'll only have to manually take care of those RSS-less sites. To do this, you need to set up an IFTTT account. What is this? It's maybe the coolest thing to happen to the Internet since, well, the Internet. 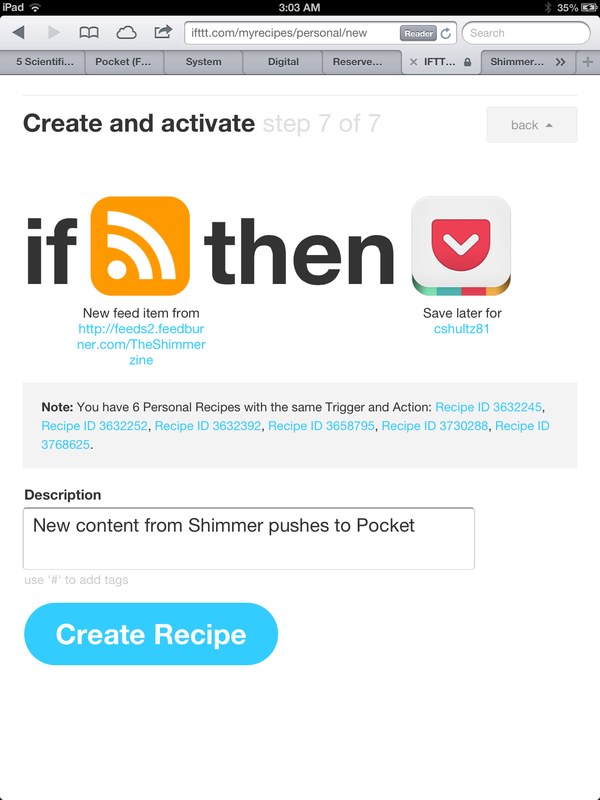 IFTTT stands for If This, Then That, and it's a way to create 'recipes' of automated triggers. So, in the case of lit mags, set up a recipe that adds new RSS content to your Pocket queue. For this demonstration, we'll be using Shimmer Magazine's RSS feed (Shimmer is a great source for contemporary fantasy, so check them out). 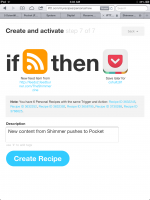 Copy the feed link as before, then navigate over to IFTTT.com, login and click 'Create Recipe.' For the 'If This' portion, find that orange RSS icon (see, it's everywhere) and select 'New Feed Item' as the trigger. Paste the link into the feed URL window, then click Create Trigger. Next, for the 'Then That,' select Pocket (or Readability, if you so choose), make sure you're logged in with your account credentials there, and select 'Save For Later' as the action. Finally, type in a description of your recipe if you wish, then click 'Create Recipe.' 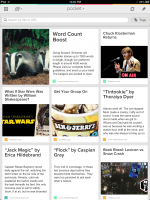 Bam—any new content from that RSS feed will automatically push to your Pocket queue. And there you have it: a one-stop shop for all your digital reading material, incorporating both articles you've manually saved for later and new fiction posted from your favorite lit mags. Pretty neat, huh? How do you stay on top of your online reading? Any methods you'd like to share with the rest of us? Maybe you've already tried some of the tips I've shared, and you have a way to improve them. Any and all comments welcome. What an incredibly useful and relevant article. Thanks for this! Great information here. A great helpful article. 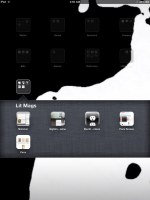 I think I'm going to check out some RSS reader apps now.